This product is just so so. I have not noticed any great results. Way to pricey for that. 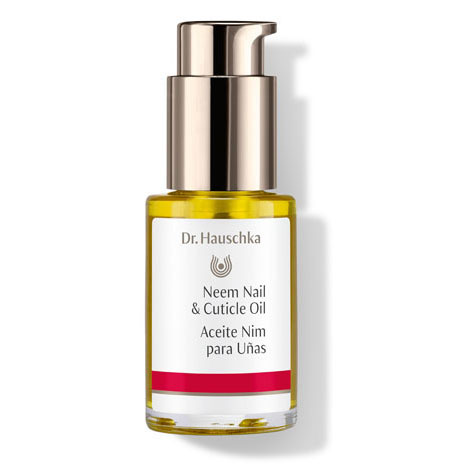 I love Dr. Hauschka's Neem Oil - my hands take a deep dive in winter with all the cold, dry air and holiday gift wrapping finishes the insult. A couple drops of this magic elixir massaged in nightly with regenerating hand cream keeps me from wanting to sit on my hands. My only problem is the pump bottle - it leaks a little. Maybe it would be a good idea to package in a dropper bottle? Love all Dr. Hauschka products. The Neem Nail and Cuticle Oil is a lovely product that is bringing life back to my nails. In just a few days my nail texture and color looks better! Finally an oil that really works! The neem nail and cuticle oil works beautifully. It's not greasy and soaks into my nails wonderfully. I use it every evening before bed and wake to soft and well cared for nails- no dryness cracks or peeling. The weather i the Northeast can wreak havoc with your skin and nails and this product is a definite boost!! Great product, worth the money. Really softens hard cuticles. I have never experienced such beautiful results with any other cuticle oil! My cuticles were constantly dry and ugly; now my nails and cuticles are beautiful! Within two days I saw results! I will be a life-long customer! I love this neem oil! It makes the nails look very healthy and prevents splitting and cracking. I just love pampering my cuticles and nails with this oil, I use my hands a lot for work and this is a great remedy for the symptoms of exposure to the outside world and to prevent hangnails and cracked nails in the winter and beyond. This is the most AMAZING product I have ever used!!!! Please purchase this product to change your nails after being ruined from gel dip! Just to be healthy again! I have long loved Dr. H's products but was reluctant to try the Neem Nail & Cuticle Oil as I was happy with the product I was using. But I was in-store for a wake-up call when I received a 2 oz. "bonus with purchase" bottle. I L-O-V-E this beauty trick; my brittle nails are stronger, grow faster, and my cuticles are healthier. I am so thrilled with the results! I love this cuticle oil; it sinks deeply into my skin and allows me to push back my cuticles so they stay nice without ever needing to be trimmed. It also prevents hang nails, and I always rub the excess into the backs of my hands which helps to keep my hands younger looking. I really like this product. It's great for my nails and helps soften my cuticles. I use it at night before I go to bed and it really makes a difference! I am 62 years old and for the last 50 years I have tried every nail product from gelatin tablets to hoof-mend (and everything in between!) and this is the ONLY thing that has actually made my nails longer AND healthier. Worth every penny! The pen applicator is also great for travel. Don't hesitate to try this - it's a game changer! I used this Neem Nail and Cuticle Oil for years with great results. Somehow I ran out and my suppliers moved or closed their doors thus I tried other products only to find that I didn't get the results I knew to be available. I'm back using what works best. Thanks. Massage 1-2 drops into clean nails and cuticles. Allow oil to be absorbed then wipe away excess. For badly damaged nails, repeat twice a day, morning and evening. Don't forget your toenails. Apply during your next pedicure. The Neem Nail & Cuticle Pen is convenient for travel, the office or the car. For complete hand care, we recommend our fast-absorbing Hydrating Hand Cream.